Expect some great spring-time weather, with partly to mostly sunny skies, highs in the upper 60s and lows around 50 degrees—warmer along the coast and cooler further inland. You know the drill. Although Houston has gotten plenty of cold fronts this winter, they just haven’t had any sticking power. And so it will go this weekend, as the onshore flow resumes later on Friday, or Saturday morning. This will usher in moisture and warmer temperatures for the weekend, although I expect highs to remain in the mid- to upper-70s. The bigger challenge comes in predicting the timing rainfall. Does it begin Saturday, and ruin the weekend? 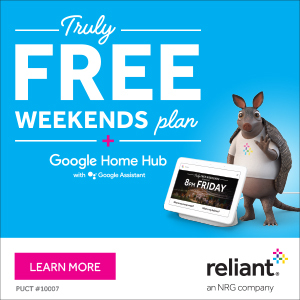 Or does it hold off until later on Sunday or Monday for the Houston area? There’s no consensus in the model forecasts, although right now I’d bet on mostly cloudy skies, but limited rain, this weekend before more widespread later Sunday night and Monday. In terms of accumulations, I don’t think we’re looking at any kind of a washout, with total rainfall amounts likely less than 1 inch through early next week for most of the region. By what measure does winter officially end today? Meteorological winter runs from December through February. 80 is the new 60! I actually find myself longing for the years I lived in Boston where one could count on winter arriving.